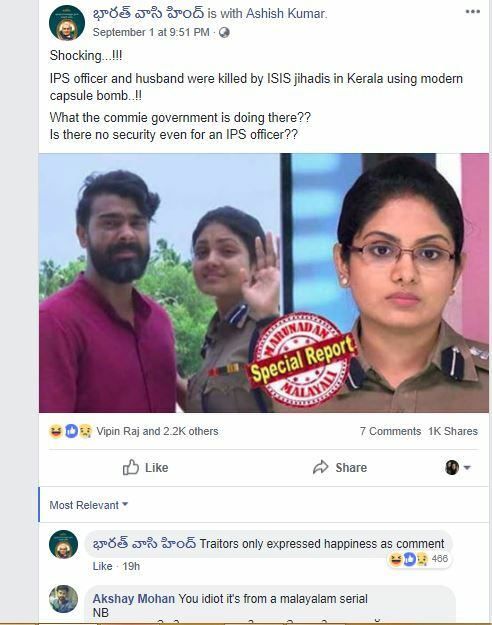 A still from popular Malayalam TV Show ‘Parasparam’ used to claim that an IPS officer and her husband were killed by ISIS in Kerala. 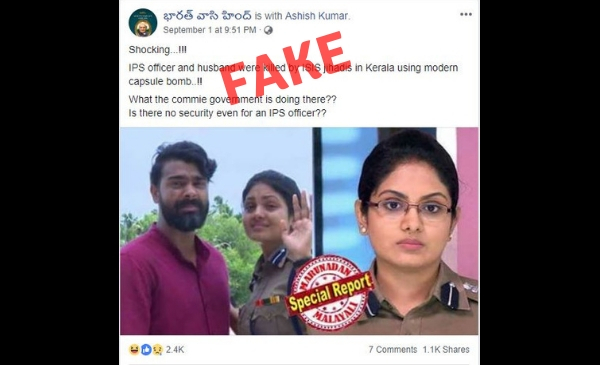 A scene from a very popular Malayalam Television serial was shared by certain Facebook users only to become a laughing stock on social media. 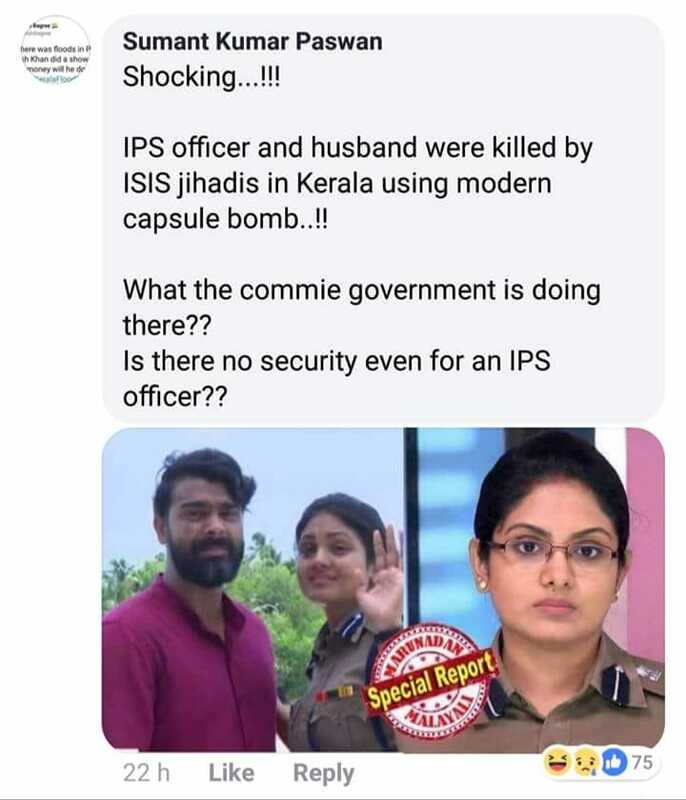 IPS officer and husband were killed by ISIS jihadis in Kerala using modern capsule bomb..!! What the commie government is doing there?? Is there no security even for an IPS officer?? 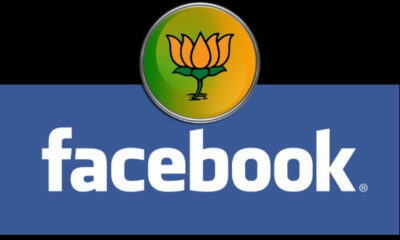 The above post is from a Facebook user భారత్ వాసి హింద్ (In Telugu) which translates to ‘Bharat Vasi’. The post got more than 2K reactions and 1K shares, at the time of writing this story. Many users who shared the post have deleted it after realising the gaffe. The image is a still from the tragic climax of the serial ‘Parasparam’ aired on Asianet. The lead actors who played the roles of IPS officer Deepthi and her husband Sooraj – are seen bidding good bye to their family before the explosion of the capsule bomb they had swallowed at gun point. They decided to sacrifice their lives by getting on to a boat and explode in the middle of a lake to avoid casualties. The post has received some hilarious comments and reactions. 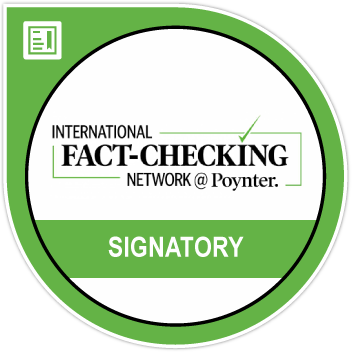 It has left many in splits that they have shared it further to expose the gaffe. A look at the post shows that out of the 2.3K reactions, more than 2K are ‘laughing’ at it. 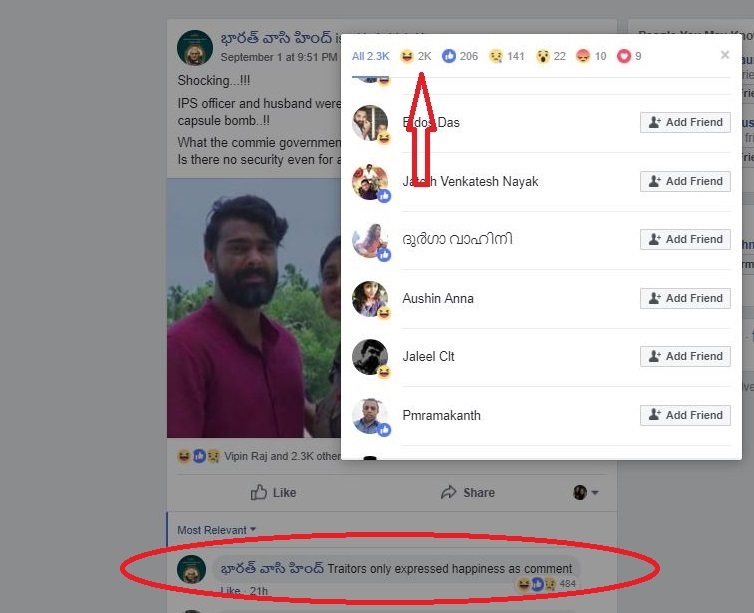 Irritated by the reactions, the owner of post భారత్ వాసి హింద్ commented, “Traitors only expressed happiness as comment“. This again attracted more ‘laughing/Haha’ emojis. Below is another user who has shared the post with a comment pointing out that the still is from the serial ‘ Parasparam’. Another user captioned it “ഈശ്വര ഇവന്മാർ ചിരിപ്പിച്ചു കൊല്ലും ചിരി നിർത്താനാവാതെ മരിച്ചാൽ ഞാൻ ഉത്തരവാദി ആകുന്നതല്ല.” This loosely translates to, “Oh God! These people will kill me. If people die out of laughter, I am not responsible”. 😂” which translates to, “The Chief Minister should resign“. BOOM traced the origin of the image to a Facebook post by ‘Marunadan Malayali‘ from the timestamp on the image. Marunadan Malayalee is an online news portal. On August 31, the website had reported that ‘Parasparam’ – the 1524 episode long serial – had come to an end with a tragic climax. The article in Malayalam describes the whole episode for its readers. The serial was aired for more than four years and had gained a lot of popularity among the Malayalam audience.